Founded in 1892, The Gore has become a legendary hotel, a symbol of the history of British hospitality. 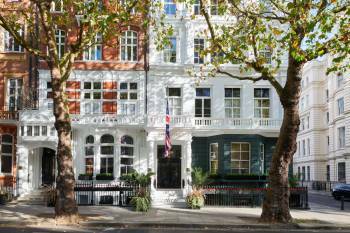 Built as a serviced residence for visitors to London’s Great Exhibition, under the patronage of Prince Albert, consort of Queen Victoria, it welcomed guests who wanted to stay in the heart of “the most fashionable area of the city “, that is to say in the houses at nos. 189 and 190 Queen’s Gate, which form The Gore today.The Gore is the perfect base for discovering the many attractions the capital has to offer. It is just a short walk from Kensington Palace, the flower-lined avenues of Hyde Park, the fascinating collections in the Natural History Museum, London’s temple of music – the Royal Albert Hall – and the most fashionable shops in Knightsbridge, including Harrods. Thanks to its central location and its elegant, sophisticated atmosphere rich in history, The Gore is the perfect venue for business meetings and private events.For work meetings or cocktail parties, wedding receptions, gala dinners or even interview shoots, the three prestigious solutions at The Gore can accommodate up to 90 guests in a beautiful setting where 19th-century elegance and 21st-century facilities come together perfectly.